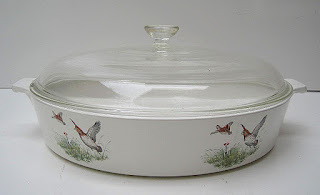 CorningWare 411: Vintage Buffet Servers & Corning Ware "Round"
Corning Ware Buffet Servers hit the market in 1964. 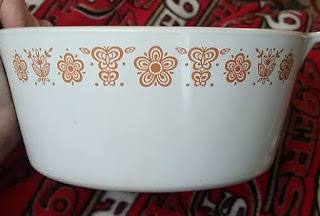 They were marked with B-Series model numbers and the sizes available were 1 quart (B-1), 1 3/4 quart (B-1 3/4), 2 1/2 quart (B-2 1/2) saucepans, with the 8 1/2 inch (B-8 1/2) and 10 inch (B-10) skillets along with the 4 quart Dutch Oven (B-4) rounding out the line. Though it should be noted that SOME of the Avocado pieces are marked with odd P-Series numbers. P-701-B (1 quart), P-701 3/4-B (1 3/4 quart), P-702 1/2-B (2 1/2 quart), P-704-B (4 quart), P-708 1/2-B (8 1/2 inch), P-710-B (10 inch). I have never found an explanation for why this was done. 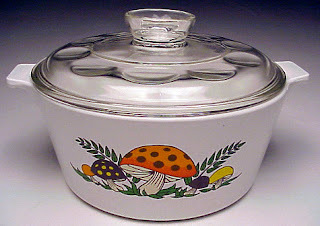 Production continued through 1967 when the "Buffet Server" name was dropped and the shape became known as "Corning Ware Round". Thus, the two new colors released in 1968 & 69 are known as Avocado Round & Butterscotch Round, with White Round finishing out the grouping. Production of "Corning Ware Round" continued through 1970 when the line was completely dropped. It did not stay dropped for long, however. In 1973, the Spice O' Life pattern crossed over, from the traditional square shape, to the newly resurrected "Corning Ware Round", complete with B-series model #s. Merry Mushroom joined the line in 1975, though it was sold exclusively by Sears & Roebuck. Buffet Servers and their white lids are made of the same Pyroceram formula as Corning Ware with two exceptions. The Red and Yellow lids that were produced for a short time were made of the Centura Pyroceram formula, thus, they are NOT Microwave safe. 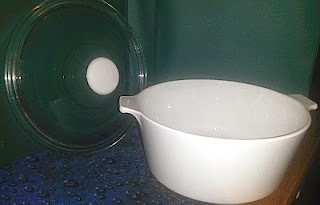 The Bakelite knobs used from 1964-1967 are safe for Microwave and Stove top use, however, Bakelite will begin to blister at oven temperatures exceeding 350F degrees (I usually don't push past 325F), so use caution.